Malaysia sees another major act of civil disobedience, as pressure on the BN grows. Malaysians have now witnessed the fourth round of rallies organized by the Coalition for Clean and Fair Elections (Bersih), an electoral reform movement that emerged in July 2005 as the Joint Action Committee for Electoral Reform (JACER). For the first time, the act of mass civil disobedience ran for 34 hours, from 2 p.m. on August 29 to 11.59 p.m. on August 30 – at least in Kuala Lumpur. The next day, August 31 was Malaysia’s 58th independence anniversary. The rally has attracted considerable media attention, mainly due to the political crisis that is brewing in Malaysia. Although the ruling Barisan Nasional (BN) party has faced serious challenges in past Bersih rallies, it has been able to repress the protestors and resist demands for major political change. But that government repression has occasionally backfired. For instance, the curtailing of media freedoms by the BN has simply led the opposition to effectively exploit alternative media. According to the model of repression put forward by the famous scholar Charles Tilly, states are not only divided between authoritative and tolerant. The differences are the degrees of repression, tolerance or facilitation. That in turn also depends on the nature of the challenging actor, agenda and actions. 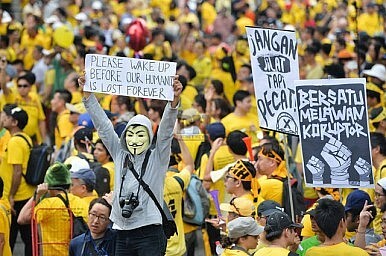 The Malaysian government’s overreaction to the Bersih 2.0 rally in 2011, such as banning 91 individuals from entering the city center of Kuala Lumpur and closing down the street, had the reverse impact to that intended. In their efforts to disperse the protestors, authorities also resorted to excessive use of teargas and water cannons. These tactics helped ensure that news coverage of Bersih 2.0 became international, lending momentum to the movement and creating huge damage for the BN itself. In 2011, a total of 1,667 individuals were arrested. That number dropped significantly to 512 individuals in the third Bersih rally in 2012. The sharp drop in arrests could be interpreted as an indicator of decreasing state repression targeting the protestors. This trend supports the argument of many scholars in which a lack of state repression is important to create the political space for social movements to function more freely, thus increasing the likelihood of movement activity. Coming back to the Bersih 4.0 rally, both sides in fact showed considerable restraint, with no significant incidents. This came despite rumors of a police crackdown and extensive evidence of government repression in other areas. The rally is unlikely to topple the government – the organized repeatedly emphasized that this was not their intention – but it was a significant demonstration of growing public frustration and anger that the BN ignores at its peril. Dr. Khoo Ying Hooi is Senior Lecturer at the Department of International and Strategic Studies, University of Malaya. The Diplomat talks with Bridget Welsh about Malaysia’s corruption scandal and its implications for the country.